ensure that their daily business operations run smoothly. Hurricane Wilma claim settlements in South Florida. for help when this happens can be overwhelming. 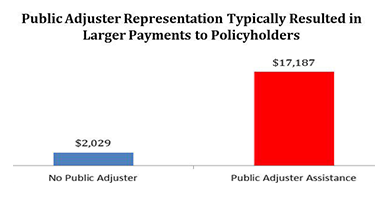 A recent OPAGGA (Office of Program and Policy Analysis & Government Accountability) Study performed for the State of Florida showed that public adjusters settle property insurance claims for more than 8 times the monetary compensation as insurance company adjusters would offer without a Public Insurance Adjuster involved (www.oppaga.state.fl.us). What is the advantage of using a Public Insurance Adjuster? Public adjusters file the claim on the policyholders behalf and negotiate a satisfactory settlement with the insurer. Public adjusters are the only kind of adjuster that works executively for you. In the process of filing your claim, you will probably encounter different types of adjusters. A Company Adjuster, often called the insurance adjuster, works for, and is employed by the insurance company and looks after the insurance company interests. An Independent Adjuster also works for the insurance company and works for the insurance company interests. Independent Adjusters are subcontractors for the insurance companies. 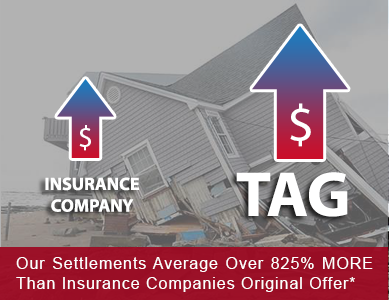 At TAG (The Adjusters Group, LLC), our licensed and bonded Public Adjusters work exclusively for you, the policyholder, never the insurance company. The Adjustors Group is an authority in loss adjustments, offering over 9 years of experience in managing commercial and residential insurance claims for the policyholder, along with 30 years in the construction industry. Our goal is to ensure our clients a prompt recovery of the most reasonable compensation for their claim. We do not receive a fee until your claim is paid. How TAG can help you? Savings: We will save you time and confusion of filing your claim alone, or letting the insurance company decide how much it should pay for your loss. It should be your choice! Free Consultation: We are here to review your policy, inspect your property Damages, and advise you of your options for free. After the consultation, you decide if want to take advantage of our services, there is no obligation. Claims Expertise: We are authorities in settling insurance claims. We understand insurance policy language, associated laws, procedures, and the necessary documentationthat is needed to complete a claim. This allows us to properly submitand maximize your claim. Construction Expertise: We are unique to many other public adjusters because we offer over 30 years of construction industry knowledge. We go beyond inspecting the surface Damages. We spend extra time to evaluate all areas that could be affected. We are highly skilled to assess primary and secondary Damages, and experienced to give a realistic estimate on the cost for repairs. Advocacy: We negotiate with your insurance company on your behalf, and protect your rights and interests. Accessibility: We keep you informed of your claim at every major milestone, and are available to you 24-hours a day, 7 days a week. Claim Satisfaction: We ensure the maximum, fair value for your claim with less hassle and frustration to you. Scott's predicament shows how Republican leaders from Alabama to Arizona are facing unwanted climate-change battles even as they question the effects of human activity on global temperatures. The governor must spend the money while placating members of his party and Mother Nature alike. This Wiktionary definition is a remarkably accurate description of the use of personal insurance-designed claims software by commercial insurers over the last decade or so. Many commercial insurance firms (CL) have adapted personal insurance (PL) claims software to their commercial claims processes and, with much force and effort and a certain measure of ingenuity, have made some progress ? but not as much as attempted or possible today. Why do so many commercial insurance companies continue to use claims software designed for personal insurance ? a significantly different business process? (50th percentile or typical) payment. *Percentage is based on total of all claims handled. Individual claims vary. Some claims settle for less than the 825% and some settle for more. "Original Offer" means: The monetary amount the Insurance Company originally estimated the property Damages value as, and offered/paid to the insured in order to induce settlement of the claim. Our video spokesperson is a paid spokesperson, not a licensed public adjuster.